Perhaps it's the appeal of being able to walk Fido down the grand staircase at the Jefferson Hotel, but voters choose the Fur Ball as a favorite way to dress up, throw the drinks back, celebrate with their pets and do good at the same time. The ball supports the Cinderella Fund, which pays for the care and rehabilitation of sick, injured and homeless animals who end up at the Richmond Society for the Prevention of Cruelty to Animals each year. Readers also appreciate benefits for humans, with the Pink Tie Gala taking second place. The annual dance raises money for breast cancer awareness, education and research with a personal twist. A group of breast cancer survivors take 12 weeks of dance lessons paired with a pro partner, concluding with a ballroom dance at the gala. 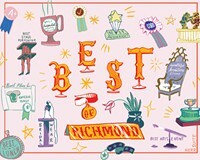 One of the most difficult-to-get-into galas each year, and most elaborately produced, is the Richmond Heart Ball, which this year raised more than $685,000 to fight cardiovascular disease and strokes. Repeat guests know to expect the unexpected — and who knows what's in store for next April's theme, a French twist revealed as Inciting a Revolution.